Simon & Schuster, 9781476783116, 368pp. The “intelligent and sweeping” (Booklist) story of the crucial year that prefigured the events of the American Revolution in 1776—and how Boston’s smallpox epidemic was at the center of it all. In The Fever of 1721 Stephen Coss brings to life the amazing cast of characters who changed the course of medical history, American journalism, and colonial revolution: Cotton Mather, the great Puritan preacher, son of the President of Harvard College; Zabdiel Boylston, a doctor whose name is on one of Boston’s avenues; James Franklin and his younger brother Benjamin; and Elisha Cooke and his protégé Samuel Adams. Coss describes how, during the worst smallpox epidemic in Boston history Mather convinced Doctor Boylston to try making an incision in the arm of a healthy person and implanting it with smallpox matter. Public outrage forced Boylston into hiding and Mather’s house was firebombed. 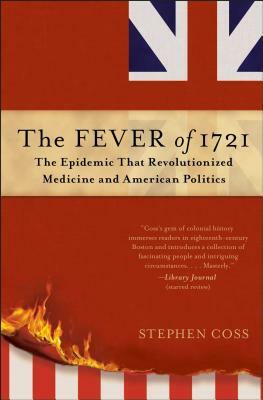 “In 1721, Boston was a dangerous place…In Coss’s telling, the troubles of 1721 represent a shift away from a colony of faith and toward the modern politics of representative government” (The New York Times Book Review). Elisha Cooke and Samuel Adams were beginning to resist the British in the run-up to the American Revolution. Meanwhile, a bold young printer names James Franklin launched America’s first independent newspaper and landed in jail. His teenaged brother and apprentice, Benjamin Franklin, however, learned his trade in James’s shop and became a father of the Independence movement. One by one, the atmosphere in Boston in 1721 simmered and ultimately boiled over, leading to the full drama of the American Revolution. “Fascinating, informational, and pleasing to read…Coss’s gem of colonial history immerses readers into eighteenth-century Boston and introduces a collection of fascinating people and intriguing circumstances” (Library Journal, starred review).